Orlistat is a medication that is used to help reduce weight in obesity. It also supports individuals to help maintain weight loss, by reducing the chance of putting weight back on. Orlistat is taken with meals and blocks around 30-40% of fat from being absorbed by your body, passing it out in your stools. It works best in conjunction with a reduced calorie diet and clinical trials have suggested that it can also have a beneficial effect on blood pressure and diabetes. It is licensed for use in adults only. Orlistat works by blocking stomach enzymes from breaking down fat. This means that the body is unable to absorb fat, and it passes through the gut in the form of faeces. This reduces the level of fat that your body absorbs, so that it is not stored in the body. As a result, you lose weight. Orlistat prevents around 30% of fat that is consumed, from being absorbed and stored in the body. Orlistat should be used in conjunction with an increase in exercise and a decrease in calories and fat. Your daily intake of fat should be no more than 30% of your daily calorie intake. For example, if your daily calorie intake is 1,800 calories, no more than 540 calories (30% of 1,800 calories) should come from fat. Most food packaging has nutritional information that can be used to help you. What is the difference between orlistat and Alli and Xenical? Xenical and generic orlistat contain 120mg of orlistat and are only available on prescription. Alli contains 60mg of orlistat and is available to buy over the counter. The higher doses of orlistat present in Xenical and the generic version, results in quicker weight loss. Results are noticeable after the first few weeks of treatment. Results with Alli may be slightly slower, however some people may decide they would like to start off with a lower strength before increasing. In simple terms, all three versions are medically the same and contain the same active ingredient, orlistat. They only differ in strength and price. Is orlistat safe to use? 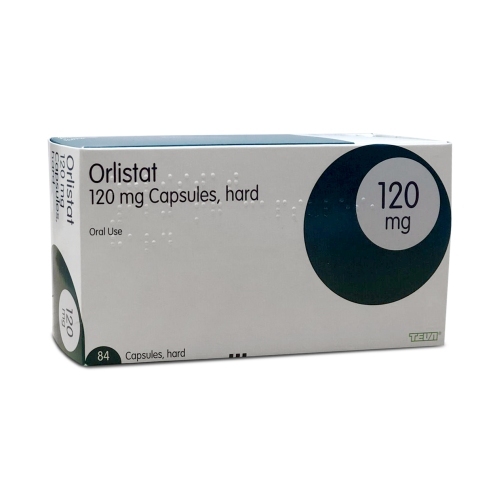 Orlistat is a licensed product and is used by millions around the world. It has been reviewed and tested for its safety and effectiveness. There have been many drugs that have been tested to treat obesity, but orlistat is the only one that has proven to be both safe yet effective. A clinical trial conducted by doctors looked at the effectiveness of Orlistat over a 2-year period. The study looked at two groups of patients, one group that took orlistat and the other group that took a placebo (tablet that has no effect). The results showed that at the end of the first year, the group taking orlistat lost more weight than the group that took the placebo. During the second year, the participants followed a weight-maintenance diet and after the second year, the results showed that the group taking orlistat gained 50% less weight than those taking the placebo. Another study looked at the weight, blood sugar levels and lipid (cholesterol) levels of 391 obese participants over a 57-week period. The results showed that those taking orlistat lost more weight and had a significant improvement in blood sugar and lipid levels than those taking the placebo. Overall, there have been many studies looking at the effectiveness of orlistat in helping to reduce weight. Most studies conclude that orlistat is effective in helping to reduce weight. Will I lose weight with orlistat? ​Orlistat has helped many people lose weight. Studies and research hava shown that orlistat is clinically effective in helping to reduce weight in obese individuals. However, in order to maximise its effectiveness and experience beneficial results, it is important to take orlistat in conjunction with a calorie-reduced diet and an increase in exercise. This way, you are likely to see encouraging results and avoid disappointment. Just remember, results will not happen overnight and it is important to be persistent and stay positive. Clinical trials have shown that those who took orlistat lost 50% more weight than those who didn't. In theory, if you are to lose 10kg without orlistat, you will lose 15kg with it. However, this is theoretical, and we are all different and respond to treatments and dietary changes in different ways. Fat contains calories, and orlistat reduces the absorption of fat, therefore you are consuming less calories. Ultimately, orlistat is proven to help lose weight, and is most effective in conjunction with an exercise routine and strict diet. Ultimately, it's difficult to predict exactly how much weight will be lost, but orlistat is an effective weight loss pill that is proven to work. Orlistat should only be used by obese or overweight individuals who have a Body Mass Index (BMI) of 30kg/m² or more. It can also be used by those with a BMI of 28kg/m² who have other risk factors for obesity related diseases, such as type 2 diabetes, high blood pressure or high cholesterol. You must be above the age of 18 to use orlistat (in special circumstances, it may be prescribed for children over the age of 12 as an unlicensed use of the medication). When should you stop using Orlistat? If you have been using orlistat in conjunction with a calorie reduced diet for three months and have not lost any weight, you should stop taking orlistat and seek medical advice. It may be the case that the strength needs to be increased (if you have been taking the lower 60mg strength), or it may be that your diet isn't as disciplined as it should be (many people have common misconceptions about what a good diet is). You may even need to start exercising more, but it is important to seek the opinion of a healthcare professional if you have reached this point. Who should not use orlistat? Can I use orlistat with other medication? If you are taking other medication, you should seek medical advice before taking orlistat. This is because orlistat may affect the activity of other medication. Can I take orlistat with the contraceptive pill? If you are taking the contraceptive pill and wish to use orlistat, you should use an extra barrier of protection. This is because orlistat may reduce the absorption of the contraceptive pill. Can I take orlistat if I am pregnant or breastfeeding? Orlistat must not be taken by those that are pregnant or breastfeeding. If you find out that you are pregnant whilst taking orlistat, you should stop taking it and seek medical advice as soon as possible. Does Orlistat help control diabetes and high blood pressure? Clinical trials have shown that orlistat has worked to improve high blood pressure, increased lipid levels and type 2 diabetes. It is unclear whether this is a direct result of orlistat, or the positive outcome of a reduction in weight. Can you buy orlistat over the counter? Orlistat 60mg comes in a branded version known as Alli. It is possible to purchase Alli over the counter. The higher strength Xenical or generic orlistat, contain 120mg of orlistat and can only be obtained with a prescription. You can visit your GP, or buy orlistat online from our UK regulated pharmacy.